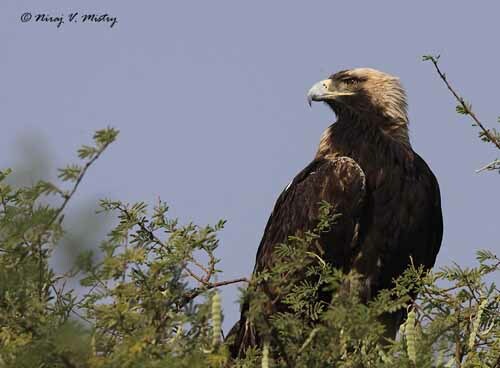 Following a natural way, we start with the Indian Black Eagle, placed in this group because some physical features and behaviour are similar to those of the booted eagles. 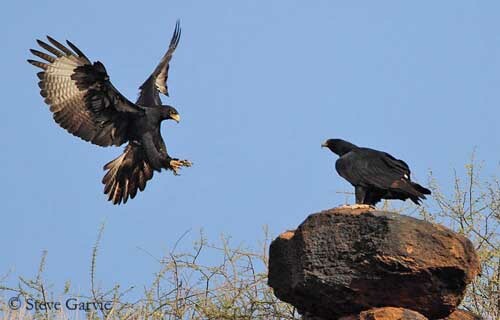 The Indian Black Eagle (Ictinaetus malayensis) is a medium-sized to large eagle with a length of 67-81 cm, a wingspan of 164-178 cm and a weight of 1000-1600 grams. 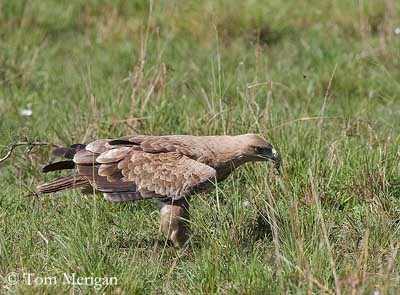 Some features such as the immature plumage and several osteological characters might be found in kites. It has black plumage overall. Bill is black. Eyes are dark brown. Cere, legs and feet are bright yellow. 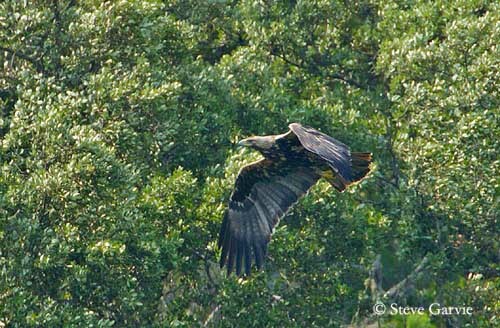 When in flight, this eagle is distinctive thanks to the large, broad wings and the long tail with weak narrow pale bands. Male and female are similar in plumage, with female larger than male. The juvenile has dark brown upperparts with some pale feather’s tips, and head, neck and underparts pale buff with blackish streaks. 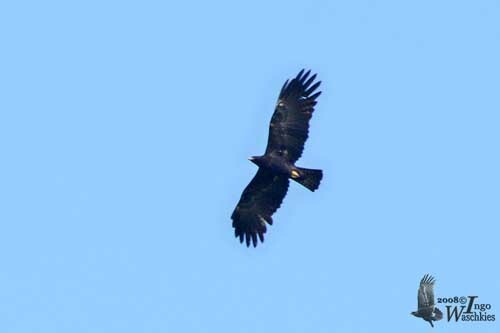 The Indian Black Eagle occurs in South-East Asia where it frequents broadleaved evergreen forest and adjacent open areas, edges and clearings. This species can be seen from sea-level up to 3100 metres of elevation. The other race I.m. perniger occurs in N and S India, Nepal and Sri Lanka. This one is slightly larger. They are mainly resident (except Pakistan where the species is vagrant). 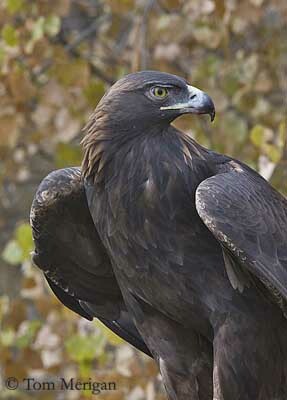 The Indian Black Eagle hunts while flying effortlessly over the tree tops and the grassy slopes. It catches nestling birds, small mammals, lizards, frogs, bats and large insects. Its foot structure shows short outer toe and les curved talons, indicating that it snatches preys and bird’s nest from the tree tops. 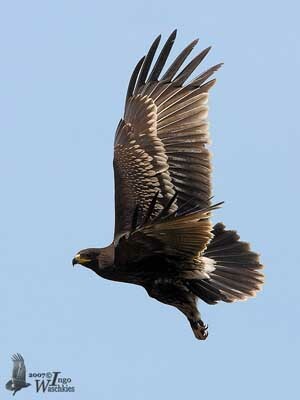 This large eagle soars with wings forming a V. It often spirals downwards into the clearings. At the beginning of the breeding season, it performs aerial displays with undulating and chasing flights, and steep dives of 300 metres or more and inclines through a “U” loop. Some flight displays resemble those of kites of genus Milvus. The pair builds a large nest in crown of large tree in forest, between 10 and 18 metres above the ground. The cup may be fairly deep, and is lined with green leaves. The nest-site is often reused year after year. The female lays one egg, rarely two. Eggs are pale with dark markings. The breeding behaviour is currently poorly known. 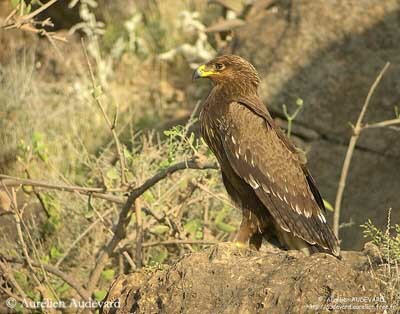 The Indian Black Eagle is a widespread forest eagle, uncommon or rare according to the range, but its populations are not currently threatened. This raptor may appear like an introduction to the other eagles’ species, because several physical and behavioural features recall those of all the other eagle’s genera. The eagles of the genus Aquila usually have more or less dark brown or blackish plumage. All species have feathered tarsi, and powerful yellow legs and talons. The strong bill is dark with yellow cere. The eyes are yellow to brown or dark brown. 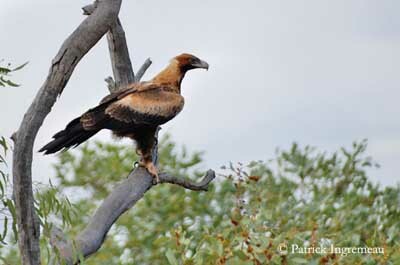 Some of them such as the Greater Spotted Eagle (A. clanga) and the Tawny Eagle (A. rapax) can be polymorphic, or at least show variable intensity in colours and marking areas. The palest species have pale buff or pale brown plumage, including head and neck. Usually, flight feathers and tail are much darker. The tail often shows paler weak bars, and the flight feathers may have narrow whitish band and pale tips. 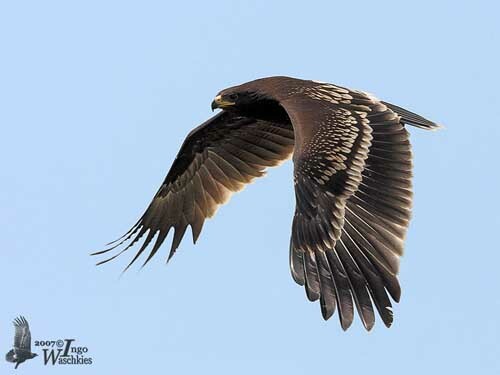 The dark brown eagles usually have uniform colour. 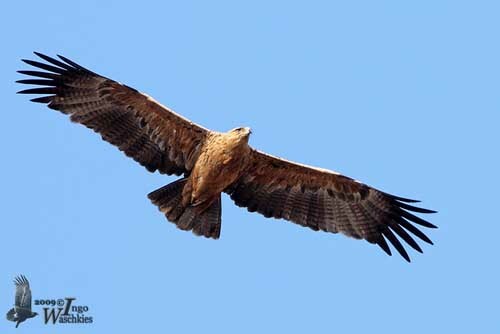 The largest such as the Spanish Imperial Eagle (A. Adalberti), the Eastern Imperial Eagle (A. heliaca), the Golden Eagle (A. chrysateos) and the Wedge-tailed Eagle (A. audax) have dark brown plumage, the two latter show rufous tinge overall. 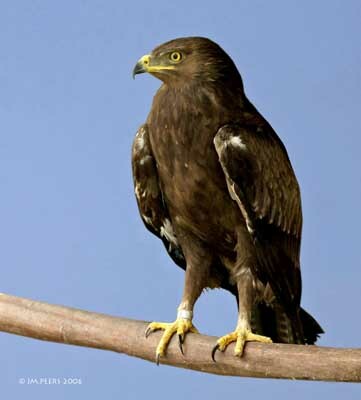 Some peculiar features characterize both Spanish Imperial Eagle and Eastern Imperial Eagle, with golden-white hind crown and hind neck, and more or less white on shoulders. 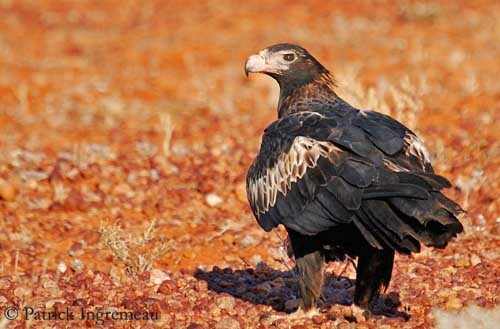 The Golden Eagle and the Wedge-tailed Eagle have rich gold rear head and neck, and whitish or rufous panel on the upperwing. 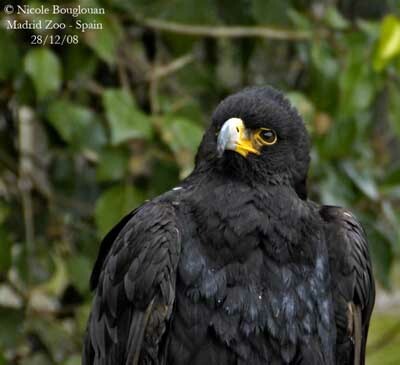 The Verreaux’s Eagle (A. verreauxii) is black with conspicuous white V on the upper back. In all species, female is larger than male. Juveniles are darker or paler than adults, but usually with mottled plumage and whitish bars on the upperwing. They need several years to gain the full adult plumage. Eagles frequent the areas from which human populations are absent, and man made lands involving degradation of the habitat. They also avoid the surroundings of cities and towns, except the Ayres’s Hawk-Eagle (A. ayresii) which in addition of dense forest and tree plantations, also frequents suburban areas. Several species need water and are living close to wetlands, wet meadows, forests and swamp-forest. 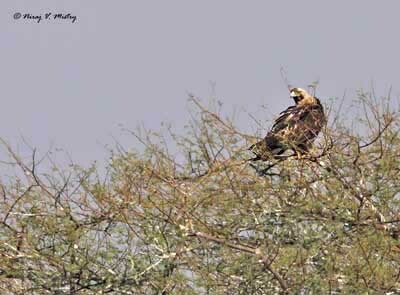 The Lesser Spotted Eagle (A. pomarina), the Greater Spotted Eagle (A. clanga), the Gurney’s Eagle (A. gurneyi) and the Cassin’s Hawk-Eagle (A. Africana) depend heavily on water. They breed in various types of habitats such as forest edges, meadows, fields, plains, forest or mountainous areas, and can be seen usually at high elevation. Some other species prefer drier habitats such as savannahs and steppes, semi-desert, scrub and plains. 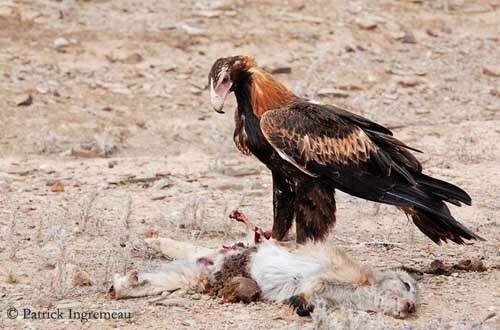 The Tawny Eagle (A. rapax), the Steppe Eagle (A. nipalensis) and the Wedge-tailed Eagle (A. audax) frequent this type of habitat, and are absent from dense and wet forest, but they also avoid the true desert. 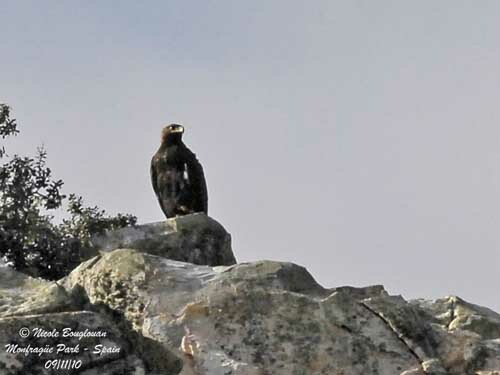 On the other hand, the Spanish Imperial Eagle, the Eastern Imperial Eagle, the Golden Eagle and the Verreaux’s Eagle occur more often at high elevation in mountains. Numerous persecutions led them far from humans. Originally, some of them bred in isolated trees, but now, they prefer forests and mountains, often at very high elevation. 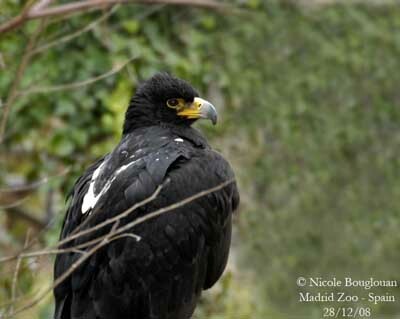 The Spanish Imperial Eagle is related to warm and temperate areas, with dry summers and rainy winters. 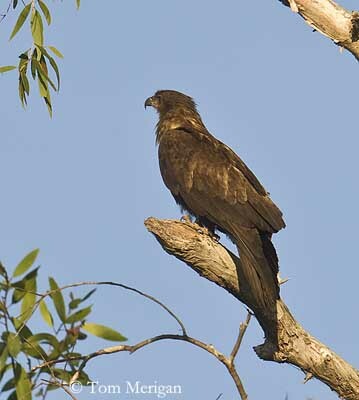 The Verreaux’s Eagle is a raptor of river gorges and rocky outcrops, up to 5000 metres of elevation. 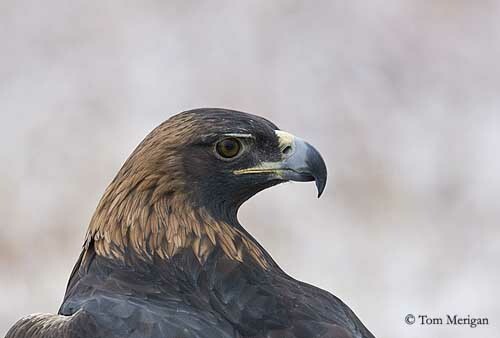 The Golden Eagle frequents several types of habitats according to the season and the range. We can find it from desert areas, plateaux, steppes and locally marshes to the tundra’s edge and high mountains in summer, up to 5500 metres of elevation in the Himalayas. They feed on medium-sized to fairly large preys such as mammals (from rodents to rabbits and hares, but also foxes, wild ungulates and cats), birds (from small passerines to cranes, storks and swans), snakes and lizards, amphibians and insects. Some eagles such as the Greater Spotted Eagle and the Tawny Eagle also take small fishes and the latter steals food from other birds. But usually, they feed on several types of preys according to their availability. They hunt by using several techniques. These large eagles often hunt in open areas by soaring flight at 100-150 metres in the air, and by diving down onto the prey. 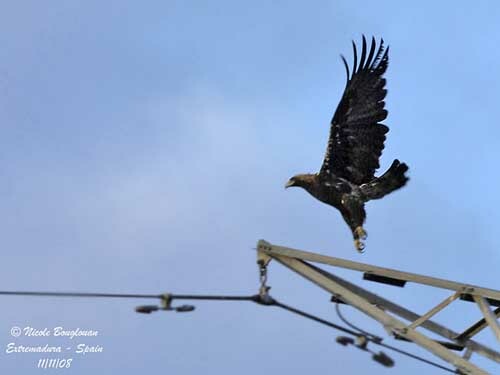 They also hunt from perches, and several eagles walk on the ground where they catch their preys. 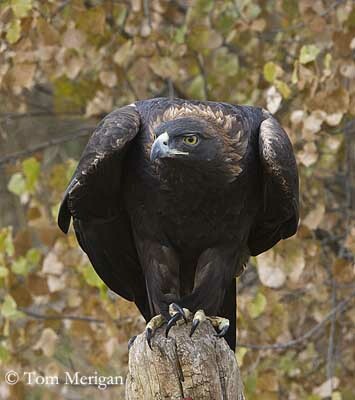 The Golden Eagle performs low flight and catches its preys on the ground. Pairs sometimes hunt together. 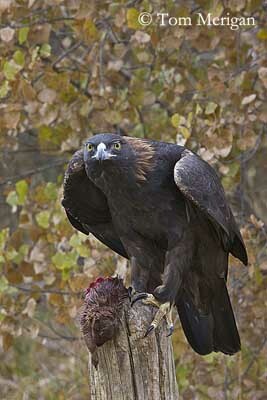 The Wedge-tailed Eagle seizes the prey on the ground or in tree canopy after swift glide or dive, and even short chase. Large preys are attacked by pairs or groups. They gather at carcasses of large mammals and rob other predators. 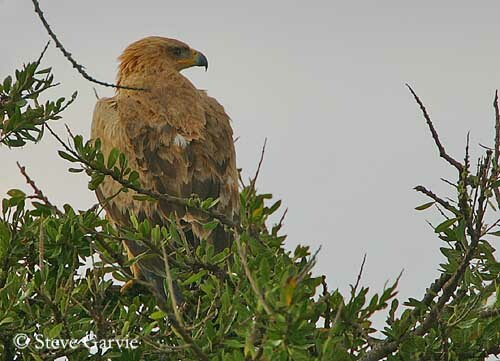 The Verreaux’s Eagle hunts mainly on the wing and stoops from a height. It also may swoop quickly around a hillside to surprise the prey. Pairs often hunt together. 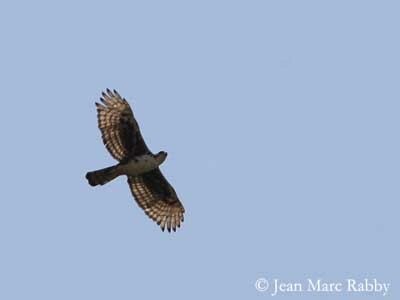 The Ayres’s Hawk-Eagle hunts by fast stoop from high soaring flight, but also hunts sometimes from perch. Attacks are usually rapid and the raptor often takes advantage of the impact which occurs on the ground after low flight or dive onto the prey. Some eagles may reach speeds of 90 km / hour or more when descending over long distances. Eyesight is an important tool for hunting, but hearing too. They kill the prey with legs and talons, but the larger preys are killed by peck at head and neck, while the claws jab at vital organs. 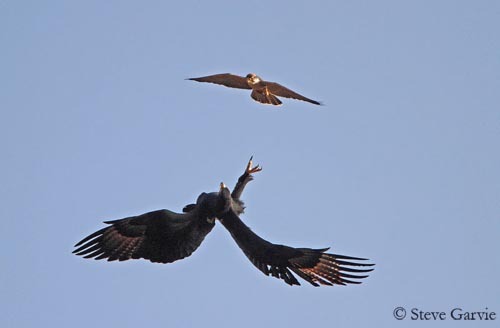 Young birds and immature feed on smaller preys and carrion, before to hunt like adults. Some species hunt in pairs or in small groups, especially for larger preys. As other raptor species, eagles defend and protect a territory, usually with display flight informing neighbours and intruders that the territory is occupied. Direct physical confrontations are rare. If an intruder persists, the display flight is slightly different with the head fully stretched out forwards and determined gliding approach, sometimes accompanied by vocalizations. In addition of territorial displays, eagles also perform nuptial displays, especially during the breeding season, but also through the year in the tropic. Pairs or lone males perform typical and spectacular courtship displays, usually above or near the nest-site, and often in the morning. The eagles of open countries display more often and during the most part of the day than the forest eagles. 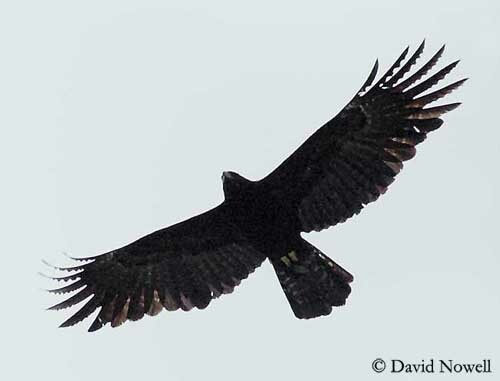 The Verreaux’s Eagle performs superb pendulum flight displays, while giving a harsh yelping call. The huge stick nest is built on rock faces and often marked by white droppings. 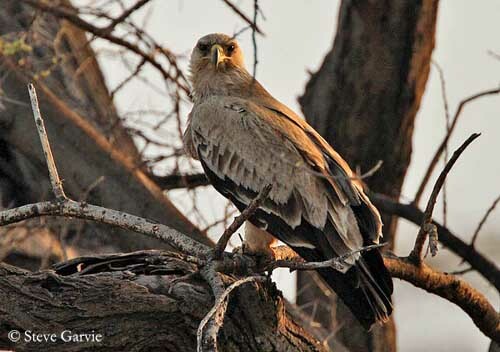 The Tawny Eagle also performs territorial pendulum flight displays accompanied with guttural barking calls. The flat stick nest is made on treetop. 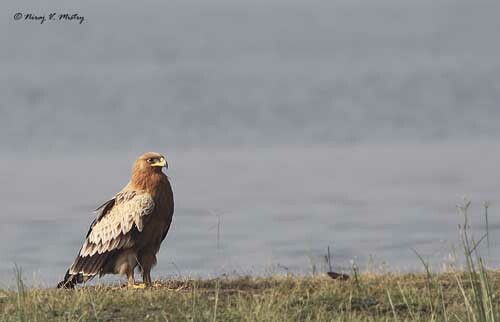 The Lesser Spotted Eagle is fairly noisy during the breeding season, uttering shrill calls close to the nest built on tree or cliff ledge. 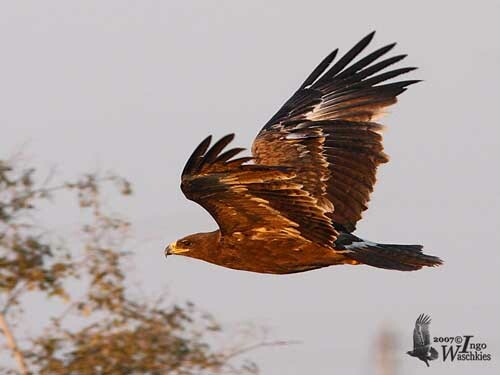 The Greater Spotted Eagle utters small dog’s barking-like calls during the flight displays while male and female perform spectacular dives and loops. The stick nest is built in tree, or sometimes on bush. Old abandoned nests can be used too. 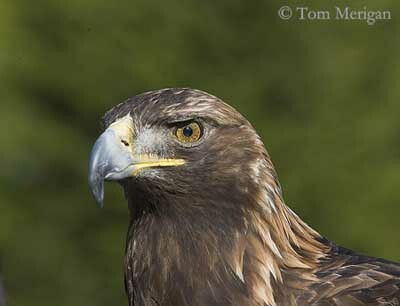 The Golden Eagle is not very vocal, only uttering yelping calls. It performs spectacular aerial displays with the male doing a dive towards the female which turns on her back and holds the talons to grasp those of the male. The pair has several nests, often placed on cliff ledge or sometimes on treetop. All species build a large stick nest lined with leaves. The nest is usually placed on treetop or cliff ledge, but sometimes on bush or near the ground in isolated areas. The female often lays two eggs (1-3) and incubates during about 40-45 days. She is usually fed by the male during this period. The chicks are fed by the adults, often the female with the preys brought to the nest by the male. They fledge between 60 and 98 days after hatching, according to the species. They remain in the territory some weeks more, learning the hunting behaviour from the adults. They need several years to gain the full adult plumage. Eagles are monogamous and usually solitary nesters. When several nests occur in the same area, they are well spaced and away from human disturbances. Outside the Golden Eagle, the Gurney’s Eagle and the Wedge-tailed Eagle, all the other species occur in Africa and Eurasia. Some of them migrate to winter southwards, others are resident. 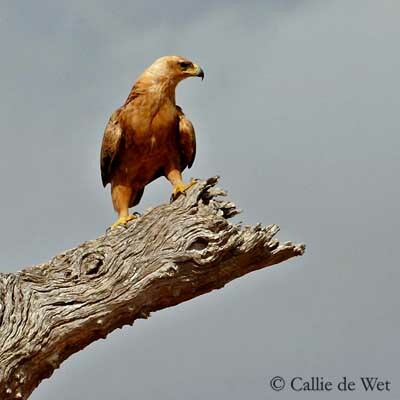 The Tawny Eagle is found in sub-Saharan Africa and India, with a subspecies in North Africa. It is resident in its range, only performing local movements into more arid areas according to the rains. This species is relatively common in many areas. The Spanish Imperial Eagle occurs in Spain, Portugal and Morocco. It is sedentary but the young birds leave the native territory and disperse, especially to NW Africa. This species is Endangered and is one of the rarest birds of prey with small populations. The Gurney’s Eagle occurs in New Guinea where it is sedentary. This is a rare species with low population numbers and reduced range. It is threatened by deforestation in lowlands. 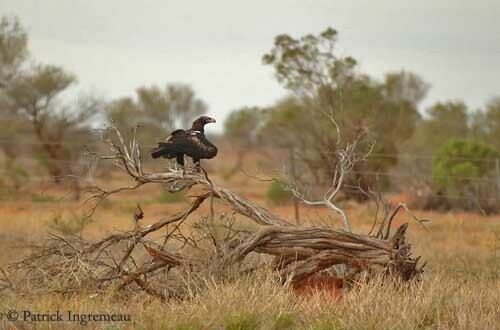 The Wedge-tailed Eagle from Australia is sedentary, except in arid areas. They are forced to move when severe drought occurs. This species is widespread and common in Australia mainland, but it is threatened by human disturbances, and illegal shooting and poisoning. 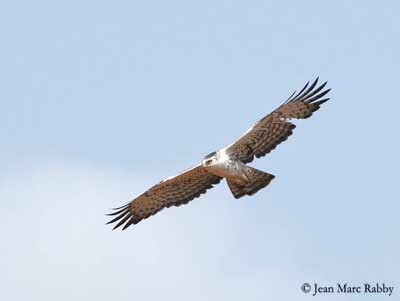 The African Hawk-Eagle (A. spilogaster) is resident and sedentary in sub-Saharan Africa. No movement reported. This species is widespread and common through woodlands and tree savannah areas. The Lesser Spotted Eagle is migratory. The European birds migrate southwards to Africa. The race “hastata” from India does not migrate. This species suffers habitat loss and hunting pressure. Statuses are poorly known. The Greater Spotted Eagle occurs in EC Europe through Russia to Manchuria. It leaves the breeding areas to winter in S Europe, Middle-East, NE Africa ad S Asia. This species is little studied, but declines occurred in many areas. 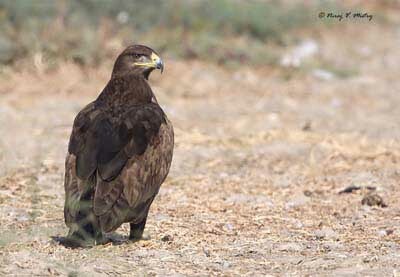 The Steppe Eagle from C Europe of race “orientalis” migrates to winter in Middle-East, Arabian Peninsula, E and S Africa. The species is common in suitable habitat, but declines occurred with conversion of steppes into fields, and persecution. 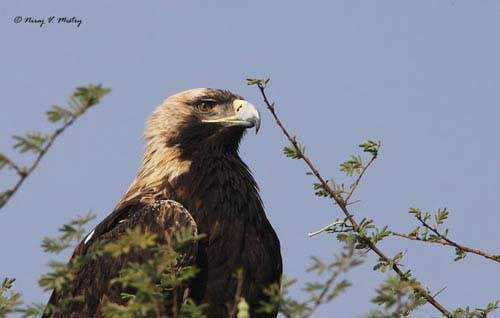 The Eastern Imperial Eagle is found in C Europe and Turkey, E to Mongolia. It winters S t E Africa, Arabia, N India and E China. This species is rare. 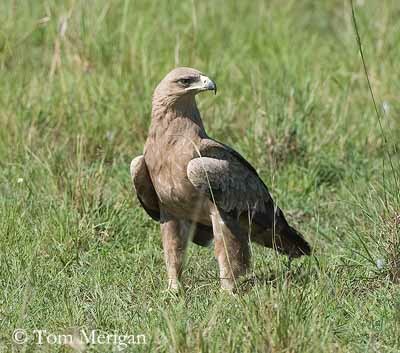 The Verreaux’s Eagle occurs in E and S Africa. It is resident throughout its range with some short local movements. This species is common in suitable habitat especially in S Africa, in spite of heavy persecutions in farmlands. 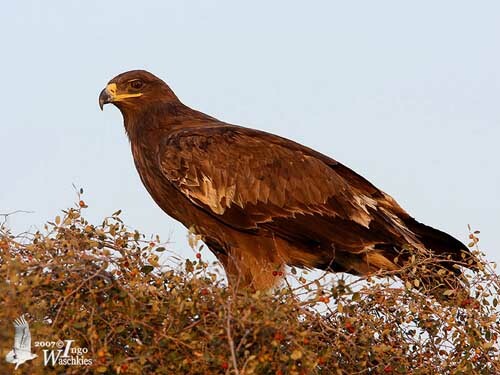 The Golden Eagle occurs in N America, Eurasia and N Africa. This species is usually sedentary, but the northernmost populations migrate from September to February to winter southwards, in more temperate areas. The juveniles are more dispersive, whereas the sedentary adults stay in the same range all year round. This species was heavily persecuted in past, and large declines occurred in the whole range. Protection of birds and conservation of suitable habitat programs are active and have involved the stabilization of the populations. Eagles are continuously threatened in all parts of their range by persecutions, hunting, deforestation, degradation of habitat and human disturbances. These large raptors need calm areas for breeding and nesting, but human developments are an important cause of large declines.